The Office of College Marketing and Communication (CMAC) provides multiple BrandK resources to members of the Kalamazoo College community and the College’s partners involved in ordering and producing marketing and communication materials, both print and digital. Consistency of visual identity and message is indispensable for Kalamazoo College. We strengthen our visibility and reputation by creating a recognizable and memorable presence that is instantly associated with Kalamazoo College. To ensure consistent implementation of BrandK, campus colleagues are required to consult with CMAC on graphic design, photography, video production or printing before beginning a project and working with outside vendors. 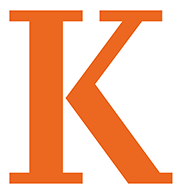 The words Kalamazoo College, the iconic K (with and without the KHornet), the College’s logo, the College’s seal and the information it contains, the names of College publications (LuxEsto, BeLight, OrangeZest) and the phrases “Zoonique,” “More in Four” and “More in a Lifetime” are registered trademarks of Kalamazoo College. For questions about BrandK or to begin a project, please contact the Office of College Marketing and Communication project manager at 269.337.7304.